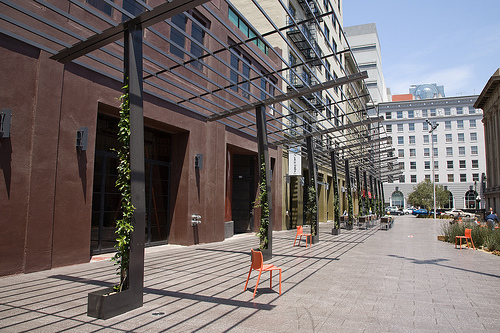 San Francisco's Mint Plaza, winner of the EPA's 2010 best Civic Place Award, part of its National Award for Smart Growth Achievement. Photo by Scott Beale. On Wednesday, December 1, the U.S. Environmental Protection Agency (EPA) presented its 2010 National Award for Smart Growth Achievement. After the presentation, there was a panel discussion with representatives from each of the winning categories: Rural Smart Growth; Smart Growth and Green Building; Civic Places; Programs, Policies and Regulations; and Overall Excellence. Don White, Gateway 1 Corridor Action Plan in Maine, Interim Steering Committee Chair and appointed representative from Camden, Maine. Tom Liebel, Miller’s Court Development in Baltimore, Seawall Development Company. Kathryn Harrington, Portland Metro Councilor, District 4. Janette Sadik-Khan, Commissioner of the New York City Department of Transportation (NYC DOT) and Amanda Burden, Chair of the City Planning Commission and Director of the Department of City Planning. I took some notes of the panel discussion. A few of the highlights are paraphrased below. How did you approach the retooling of these spaces that were originally for cars? White: We worked with communities so they understood why restructuring the route for safety and sustainability was so important. Yarne: If you build a broad coalition specifically around self-interest (real-estate and land values, usage of space, community improvement), you can overcome an opposition to change. Why were teachers part of a sustainability plan for you? (The Miller’s Court development project provides affordable housing specifically for Baltimore City public school teachers). Liebel: We thought that providing a good place for teachers to live is ultimately how you stabilize and revitalize a city like Baltimore. Creating communities for the middle class to enjoy a good quality of life is the basis for improving any city. For NYC, public health is front and center. In the EPA we often lose this piece. What are you doing in NYC to bring public health into the picture? Sadik-Khan: There are a number of angles to approach the issue. In New York City, we have a crisis of obesity so we need to figure out how design our places so people are engaged in physical activity. It’s also an important economic driver because we want to create a city that’s attractive – easy and safe to get around – so more people will move to NYC. It’s good for business and for health. Can you talk a bit about the process and the support from the federal level on these projects? White: The Federal Highway Administration has been very active from the beginning in helping a small rural area in MidCoast Maine deal with growth issues. Leibel: We took advantage of a lot of funding mechanisms that the federal agencies provided. Yarne: Four of the historic properties that surround the plaza are on the National Register of Historic Places and received tax credits. I think there are multiplier effects to tax credit programs that are very helpful for urban areas. Harrington: In Oregon we leveraged the work of different federal agencies. For example, the regional parks and trails system intertwines several federal agencies that work within the city transit system and beyond. We work with the U.S. Park Service and U.S. Forest Service to ensure that policies interact to provide good connectivity and access for walkers and bikers. Sadik-Khan: Federal funds make up 20 percent of New York City’s budget, but the City does not receive direct federal highway funding. Providing additional ways to get money in the hands of people who will use the money quickly and efficiently would help NYC DOT do its job. Have you studied park-oriented development? Is this an area for further study for New York City? How have you dealt with push back to your work on smart growth such as the New York Times article on bike lanes? How are you dealing with opposition? How do you foster community involvement? Yarne: There’s good quality involvement and destructive participation. You must be well informed to make good decisions and the participation process needs to be structured and process-oriented. In San Francisco we discerningly reached out to particular communities while focusing on the products we were creating. Harrington: The Metro council in Portland is structured so that all communities have an elected official. We have to do a lot of outreach. The bottom line is that it’s all about talking with communities. White: In MidCoast Maine all the areas were interested in improvement and each community has a representative and a vote. We conducted outreach through town and city departments. For the most part, everyone should have a voice and make themselves known. Liebel: “Don’t lie” – be honest and tell the community what you can and can’t do. Communities can become your greatest ally. What can other communities learn from you? Yarne: We think that Mint Plaza demonstrates that you can have state of the art green stormwater management in an urban setting. We used a civic place as an ecological feature. Liebel: “If you do it in Baltimore you can do it anywhere.” We pieced together funding available to any community – our work was driven by private development. Harrington: We invested in research and data: “What did the local counties want and want to become?” We figured out what we want in the future by communicating. Sadik-Khan: A strong vision of where you are going achieves success and buy-in. You also have to move quickly. For more information on the specific project winners, refer to the EPA’s webpage on the 2010 National Award for Smart Growth Achievement, as well as Part 1 of the event coverage.